Cacoo is absolutely free and extremely easy-to-use online diagram building webapp that allows you to transform your browser window into professional drawing application. With it you can draw whatever you like, from wire frame diagrams, site maps, network and URL charts, mind maps and much more. Create diagrams online! Feature that distinguished Cacoo from other similar services is its focus on real-time communication and collaboration. With the help of others, even the most complicated diagrams can be made easily, and more importantly shared with few clicks on any number of sites or blogs. To make updates and modifications of already shared content even easier, whenever you change your diagram on Cacoo, shared images will also instantly receive that update. 100% free and user friendly online diagram tool! Diagram-building online tools have become commonplace over the last few years, appearing in large numbers and offering users from all around the world easy way to create their home, student or professional drawing directly from their computer or portable device without the need to download standalone clients. To cater users of all knowledge levels, these apps were built with various goals in mind, which enabled only few of those apps to truly capture widespread popularity by managing to cater truly everyone. One of those user-friendly professional-grade tools is Cacoo, which was created in October of 2009 with a goal to enable everyone to easily feel the benefits of not only highly capable diagram editor but also deep integration of collaboration, sharing and easy project management. Cacoo is a highly capable cloud-powered diagram creation and management tool that can help anyone from novices to professionals to easily create diagrams directly from their web browsers. To make this process as easy and intuitive as possible, developers of Cacoo crafted a very easy to use, versatile and scalable diagram editor that can be used for creation of all types of diagrams, both by the work of individuals or by real-time online collaboration between team members who can easily connect one with another, create complex diagrams with ease, brainstorm and create diagrams on the fly as their creativity is running wild, and more. Finished diagrams that are created with Cacoo can easily be shared using integrated hosting that makes your diagram easily accessible by anyone, URL sharing, direct sharing into Twitter,Facebook, Google+, printing and of course export to local storage via PNG and SVG formats. Create diagrams online today! 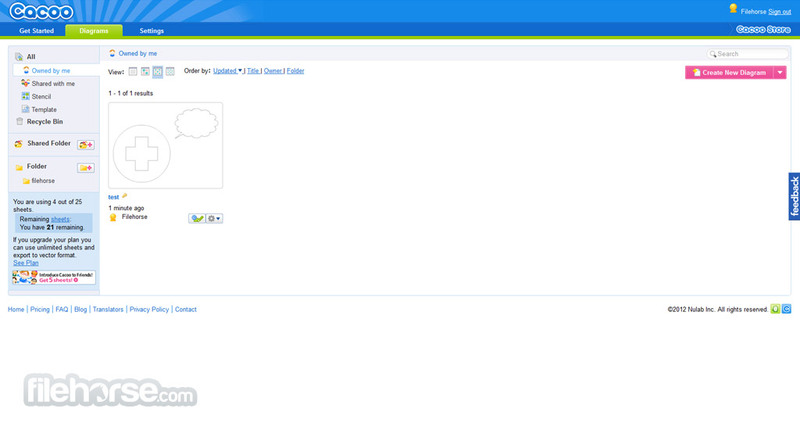 Easy user interactions with Cacoo editor is something its developers spent a lot of time optimizing. Tools for creation and manipulation of diagram elements are very sophisticated, enabling users to easily drag and drop objects froma large object library, draw connections between them manually or automatically, upload images to make diagrams more descriptive (those images can be edited and trimmed directly from within Cacoo), use styles, variable grid sizes to witch objects with snap to, text entry tools and much more. Editor allows unlimited levels of undo actions, users can draw new objects easily, invite people to work in real time on a single diagram, leave comments and annotations, use integrated chat tools, and more. Interface of Cacoo is spotless, with professionally organized editor that is intuitive enough to be used even by novices. Free version of Cacoo supported creation of up to 25 sheets of diagrams that are hosted inside one Project folder, up to 15 team members working on one diagram and only PNG export. Most restrictive, free users don’t have access to edit history and highlighting of undo differences. Premium tiers that unlock many advanced tools and remove restrictions start with the affordable $4.95 per month and can go up to $99 per month for team license that can host up to 100 users. With flexible tools, large feature set and incredible attention to detail, Cacootoday represents one of the most capable and easy to use professional diagrams editors of all types, shapes and sizes. Creating attractive diagrams, such as wire frames, mind maps, network charts, and site maps, are very easy for anyone as you can simply pick and "drag and drop" elements from a large library of stencils. 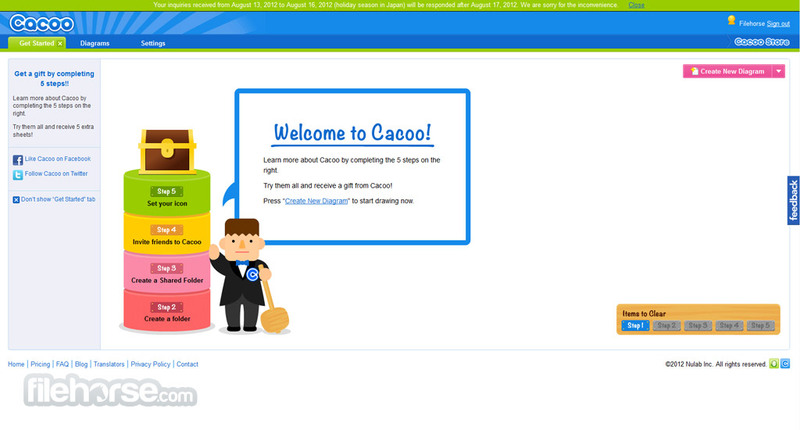 Cacoo covers all the basic drawing functionalities. A huge number of stencils, aligning functionality, background sheet, freehand options, and many more assist you to draw nice diagrams efficiently. Create diagrams online! 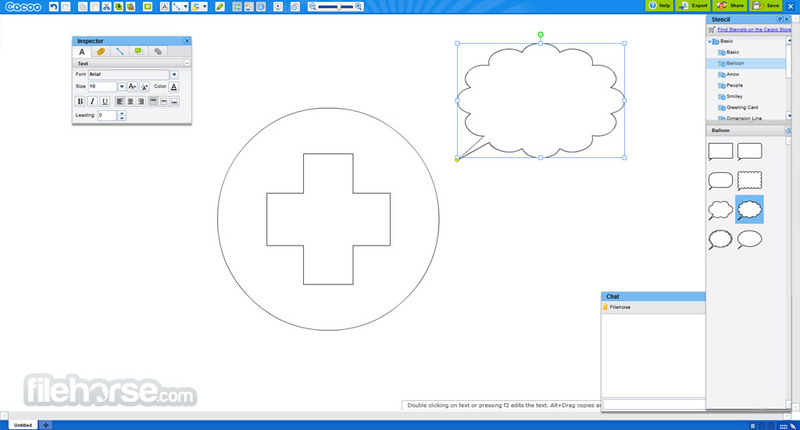 Multiple users can share and edit one diagram simultaneously. Changes are shown on the sharers screen in real time. Collaboration will be more creative and productive as team members can plan and review cooperatively.